One of the major reasons for having a garden-forgetting about the benefits of exercise and communing with nature-is to enjoy the beauty of flowers. Of course, Mother Nature was not really interested in our likes and dislikes when flowering plants were developed: From her point of view the only reason for the existence of flowers is to manufacture seed and guarantee the future survival of each species of plant. Luckily what attracts the bee, moth, or butterfly is also attractive to our eyes. Wildflower gardens are very easy to maintain and are very popular with new gardeners and gardeners who don’t have a lot of time to devote to gardening. Wildflower gardens are beautiful and since wildflowers typically grow tall and fast, gardens full of Wildflowers are often real showstoppers. Look for Wildflower seed mixes that are full of Wildflowers native to your area or pick some exotic Wildflowers from halfway around the world; they’re all beautiful! One of the best times to start planting your wildflower garden is during early spring. By mid-summer, the wildflowers would have grown already and drowning your garden in a colorful haze and a nostalgic feel. An important thing to consider when growing wild flowers is to start by letting them grow healthy and strong from the beginning. Among some of the easiest wildflowers to grow are the blanket flowers, blue chicory, columbine, purple coneflower and black-eyed Susan. 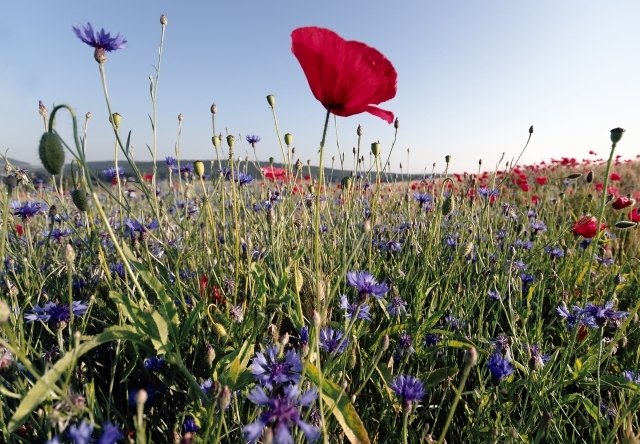 To jumpstart your wildflower garden you need to prepare the soil first. Flowers would typically go into flowerbeds. However, if you do not have those then simply prepare the area where you are planning to plant them. Begin by removing the topsoil and looses the ground underneath. You could simply scatter the seeds in them and sprinkle some soil over the seeds and run water to them thoroughly. Water is the most crucial thing that wildflowers need to grow. A blanket of rain at least once a week should do hte trick. However, if that does not happen, you can simply water them yourself enough for the seeds to start growing. Weeding out your wildflowers is the next most important step. Weeds are the natural competitors of wildflowers for nutrients, water and sunlight. They even grow quicker than your wildflowers. The best way to go is to remove the competition and weed out regularly. To make your flowers even more beautiful and vibrant, fertilizing would be a great thing to do. Giving them plant food every 6 weeks should help ensure that they will have a very beautiful bloom all throughout summer. Now that your wildflower has grown, you can minimize on the water. As for anticipating the threat of pests and insects on your wildflowers, you can stop your worrying because wildflowers are amazingly resilient against these pests. As long as they are taken cared of properly from the start, your wildflowers should have a long and full life until the fall when they die. The good thing is you do not have to remove them; you can just leave them on their own and wait for their seeds to fall into the ground. Come spring, all you have to do is weed out your garden a bit and prod the soil and wait for the new cycle of wildflowers to grow.